Pushcart Press is devoted to writers, small presses and non-commercial publishing. Pushcart Press was founded by Bill Henderson from a studio apartment in Yonkers, New York in 1972. A soon to be ex-editor at Doubleday Co., Henderson invested his tiny savings in the revolutionary The Publish It Yourself Handbook (1973) and distributed it by foot and auto. This collection of essays by Anais Nin, Stewart Brand, Virginia and Leonard Woolf and twenty others sold over 70,000 copies in four editions and was one of the keystones of the modern small press revolution. In 1976, Henderson and a group of Founding Editors that included Paul Bowles, Ralph Ellison, Joyce Carol Oates and Reynolds Price, started the Pushcart Prize anthology to recognize and celebrate the best work in the rapidly expanding independent publishing movement. Through the years since, the Prize has honored the art of thousands of writers and hundreds of presses. Each edition features reprints of work by about sixty authors from dozens of presses as selected from nominations by small press editors and Pushcart’s staff of distinguished Contributing Editors. Pushcart's office is an 8’X8’ backyard shack on Long Island, New York. 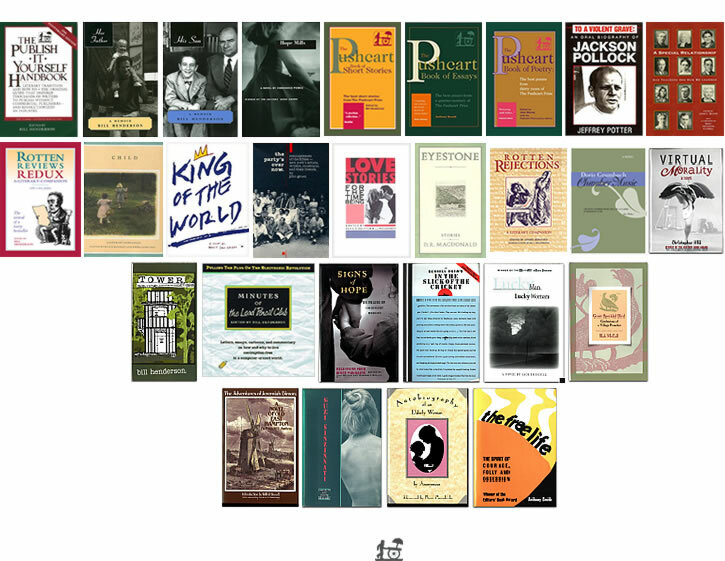 Pushcart has published over sixty titles, distributed by W.W. Norton & Co., and has been recognized as among the most influential publishers in American history by Publishers Weekly. Pushcart won the National Book Critics Circle Lifetime Achievement Award (2006), The Poets & Writers/Barnes & Noble Writers for Writers Prize (2006), and Publishers Weekly’s Carey Thomas Prize for publisher of the year (1979). Bill Henderson comments: "Pushcart Press is a testament to the non-commerical flourishing of American fiction, poetry and essays. As commercial publishers consolidate into few profit-driven conglomerates, small presses like Pushcart encourage literature that is lasting, important and exciting. This is our goal and our passion." Over the years, Pushcart Press has remained a one-person outfit, sustained with the help of hundreds of friends and contributing editors. Pushcart’s letters and manuscripts and other documents are archived at the Lilly Library of Indiana University, Bloomington, Indiana. The Editors’ Book Award. In 1983, Pushcart Press inaugurated its Editors’ Book Award series to identify and publish manuscripts that are rejected by today’s bottom line, profit driven commercial presses. Each manuscript is nominated by an in-house editor who has seen his or her literary enthusiasms rejected by an employer. Twenty-one books have been published in this series to date.